When I was 7 and my younger brother was 5, our family went on a road trip to Turkey through Syria. I have fond memories of that trip but the one that always comes up when we mention that summer is how me and my brother were nearly lost in Istanbul because of ayran! It was a beautiful sunny morning and our guide arrived early at the hotel to continue our tour of the city. He would take us in a beautifully decorated horse carriage through different markets and monuments trying to teach us a few Turkish words along the way. We stopped at one of the markets and went for a walk. Along the way we passed by this shop that served fresh juice and they had a huge fountain that didn’t have water! It had Ayran instead! Me and my brother were enchanted by it but mum and dad decided that we should move along and we followed them reluctantly. A few shops down the line , mum and dad were checking out a gift shop and me and my brother got bored and decided to go back to the magnificent fountain. We waited for a moment when mum and dad were not looking and rushed outside and down the street to the ayran fountain. Mum tells me of the icy cold feeling that washes over you the minute you realize that your child is missing. It paralyses you and for a few minutes, panic takes over and the only thing your brain can do is think of all the horrible possibilities. Two kids, in a foreign country, in a huge city, we don’t speak Turkish, and most people there don’t speak arabic. A frantic search through the gift shop and the surrounding shops, a call to the police and a horrible 15 minutes later they find us standing by the ayran fountain unaware of how the same 15 minutes that passed in the blink of an eye for us were the longest and most horrifying 15 minutes my mum recalls of our childhood. You’d think that after this incidence ayran would have been banned from our house or dubbed that drink that must not be named but it wasn’t. We loved this drink as kids and still do as grown ups and my mum makes plenty of it every summer. Ayran is a great way to use up any left over whey (the liquid you get from straining yogurt) if you make your own yogurt or labneh that is if you have any after making whey pancakes. Yogurt vs Whey: You will find many recipes and variations, the recipe I am sharing today is my favorite. My kids actually like to drink the whey (the liquid you get from straining yogurt to make greek yogurt or labneh) with a little salt. My husband on the other hand likes his drink to be 100% yogurt with a little salt (Blending yogurt turns it into liquid). The moral of the story is: use my recipe as a guideline and play around with the proportions and see what you like best. Before I let you go, tell me my dear reader. Did you ever get lost as a child? care to share the story? Posted in Cheese and dairy, Drinks and tagged mkheed, savory drink, savory lassi, shanena, What to do with whey from making yogurt, whey, yogurt. Bookmark the permalink. I don’t think I ever got lost as a child. I know my sister did. We were in a department store and she crawled under a clothing wrack and sat down to rest. My parents and store employees searched for her for what seemed like an eternity although I really don’t remember how long it was – probably not very long. Miss A was also briefly out of my eye sight for several minutes at a kids’ museum in a different city last summer. Most terrifying moment of my life yet. Something caught her eye and off she went like a shot. She’s so tiny it’s hard to see her behind things. Oye! So I can just imagine your parents’ panic! That said, I can also see why you were completely distracted by a fountain with this delicious looking drink! I don’t recall ever getting lost but lost my daughter once for mere minutes that did feel like a lifetime! Love the cool refreshing look of this drink, it would be wonderful and creamy… The mint so refreshing! No parent should have to go through the experience of a missing child–just horrible in the worst way. 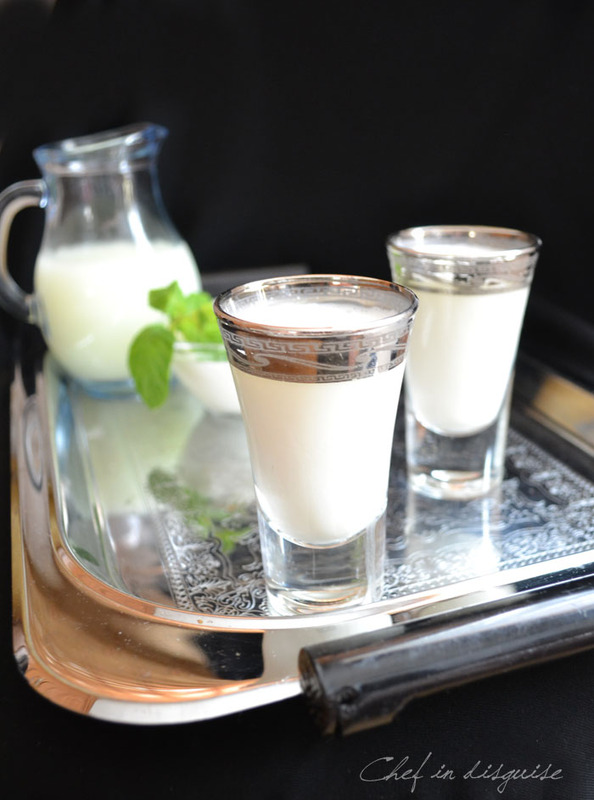 I love Ayran, and have posted pictures of it from stands in Istanbul, but have never tried to make it. Only lassi. Thanks for the recipe! Mint is never optional. At least not for us at this time of year. Looks great. Oh my! that sounds horrifying! My daughter once slept in the bus on the way home and they thought she was absent and drove right by the house! 10 calls back and forth to the school and driver and some 15 minutes later she was home. I started driving her to school after that! What a horribly scary 15 minutes for your mom! It’s funny how as kids we didn’t think about what the parents were going through when we would just “walk away.” No big deal. 🙂 This is definitely one of those recipes that I’ll have to make to see how it taste. At this point I can’t even imagine it. Have never heard of it nor had it, but certainly looks delicious! Great pics! I really like ayran! I guess growing up we drank it as a Georgian or Armenian drink? Very refreshing in the summer and one of my dad’s favorites. I’d love to make it myself, so thanks for sharing! Okay, my tongue is twisted trying to say those names. Regardless what it’s called, it sounds delicious! Oh my, your poor mother, what a horrible experience for her. My mum and dad drink this every morning and they swear it keeps them fit and healthy! And yes, as a child I was with my grandmother in a small seaside town and they were doing a promotion for a petrol company whose symbol was a tiger. Someone who was dressed up as a tiger tried to talk to me, I got scard and bolted and they found me (not too long after) hiding in a shop. Have never liked those full on fancy dress costumes! Sawsan, just read your previous post, I was shocked that u had that horrible lorry crash..hope you and the kids are ok? Hope you recover from the ‘shock’, I can imagine. I recently came back from Istanbul and I was in love with Ayran too (and sahlep! )..my husband strangely likes his ayran with some chopped chilli and salt..I must try using whey some time as usually we discard the whey. your pics are stunning dear. Ayran with chilli sounds like a great combination. do you strain the greek yogurt? is it whey powder that is used? Greek Yogurt is a thick yogurt you get by staining usual yogurt. The liquid that results from straining is called whey. I can only imagine that paralizing fear, Sawsan as I don’t have children myself. I took my nephew out to our Science Centre a few years ago when he was 10 and I made certain that he understood in no uncertain terms that we must ALWAY be in eye contact with one another. I was walking on glass all day, worried he would disobey, but he is a good boy and didn’t! I thanked him profusely, but in all honesty I think he would have been equally paralized with fear if he had walked off! This yogurt drink sounds very different, we tend to pair yogurt with fruit for drinks, thereby sweeter combinations, we call them fruit smoothies; they are all the rage right now as many of the fast food places are offering them. I will try your recipe for sure. I love fruit smoothies but this one is if I dare say, more refreshing. I found this post on Pinterest – thank you! The photos are beautiful, the recipe sounds delicious, and I loved the line “You’d think that after this incidence ayran would have been banned from our house or dubbed that drink that must not be named but it wasn’t.” Looking forward to poking around a bit to see what other treasures I might find. Thank you for stopping by Rachel and for your sweet comment. 3 cup of whey, the juice from yogurt. How many cups of yogurt to you strain to get the whey? Can the whey juice be purchased on it’s own? The amount of whey you get depends on the type of yogurt you strain, I don’t know if you can find whey commericially. This looks like a delicious and refreshing drink, Sawsan. It’s unlike anything I’ve ever seen but I will try anything once and would love to try this! Thank you for sharing. I’ve had sweet drinking yoghurt but never savoury… sounds interesting! My brother and I once “ran away” and mum freaked out and called the police. The reality was that we’d asked her if we could go play at our friends’ place down the road while she was on the phone, and we thought she nodded yes and given us a wave with her hand, but she was probably nodding into the phone and shooing us, and not listening to us at all! I was only about three and managed to climb a full-height garden fence (with the help of my brother who was a little under five), and we had a great old time playing in the friends’ yard (they weren’t home). We couldn’t understand the fuss when we jumped back over the fence and walked home! The way she tells the story is still totally different to the way we tell it. I love the sounds of this yogurt drink. Glad your story had a happy ending — although as a mom I can only imagine how difficult those few minutes were for your mom! A nice change-up, love your yogurt drink recipe, thanks. Oh, your poor mother. As mothers, you and I can understand how terrifying that must have been, but a Ayran fountian? How could you not get a closer peek. I will have to try this…intriguing. What a story to remember by with this drink! I’d freak out if my kids are lost in a foreign country! I’ve never tried savory yogurt drink – now that will be my first and this looks so refreshing!! I know! all the mothers I know freakout when I tell them the story. yes i have memoeries of being lost ,.. it wa sin a childrens park.. i thought i was holding my dad’s hand an dsuddelnly realsie dtaht it was not him.i left that hand and then i was earching for my parents.. they were also scared … and then i remember some nuns from a conevnt telling me that they will take me with them if my parents dint find me… ooh that fear which came into my mind” will i never see thm” i must have been smehere between 6 -8 years.. not sure.. anyway my dada came there and i was sooo glad.. relived happy.. i dont know… it was just a few minutes but i felt as if it had been hours!!!! when i think of it now i think” what if tjose nuns had taken me away?” they will not do that but what if..og god dont veen wnat to think abt it… after so many years this came back into my mond and my heart is racing! Thank u very much for sharing your amazing recipes with us,living in the usa makes me always graving for our traditional foods and drinks.. The Daring Cooks’ April 2012 Challenge – Create Your Own Recipe!